Exquisite Collection of Nevada Dry Creek Turquoise Jewelry by renowned Native American Artisans to compliment any Style or Budget. 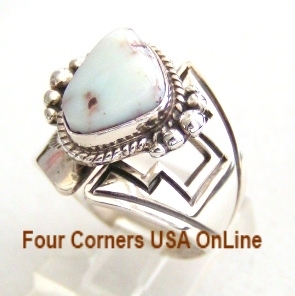 We offer an array of quality Dry Creek Turquoise gemstones in our Jewelry with many elongated large stone rings sporting rare gem quality specimens. 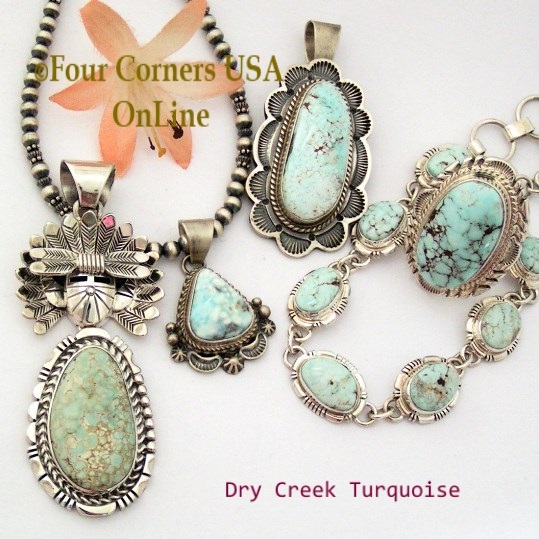 Choose below for our complete selections of Dry Creek Turquoise Bracelets, Dry Creek Turquoise Earrings including an assortment of dangle and post style earrings, Dry Creek Turquoise Pendants, Necklaces and Jewelry Sets as well as an extraordinary selection of Dry Creek Turquoise Rings for both Men and Women. Dry Creek Turquoise has gained much popularity over the years with its creamy pale blue coloring and golden to cocoa brown matrix. The coloring very much reminds me of Larimar, of course Larimar does not have the beautiful golden and cocoa matrix! The Dry Creek Turquoise mine in Nevada was first discovered during the early 1990's by the Shoshone Indians. The Shoshone are not typically jewelry makers and had privately leased the mining rights on a limited basis or used the stone as trade. Dry Creek Turquoise had been mined for a number of years producing a creamy blue stone often with a golden or cocoa brown matrix but can have extreme variations depending on the areas mined at any particular time. 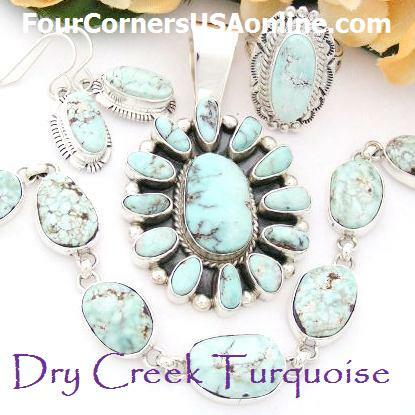 Dry Creek Turquoise is a hard American Turquoise and therefore specimens cut for Native American Jewelry are not treated or stabilized showcasing their natural beauty and color. You often hear that the Silversmith keeps their finest stones for their best creations! Our newest selection of Dry Creek Turquoise Rings for Men and Women shows just how true this statement is. 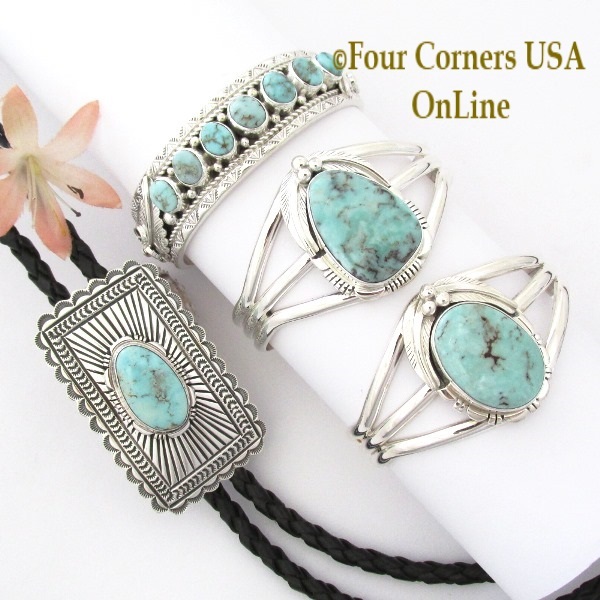 Large elongated stones in a variety of deeper color Dry Creek Turquoise in a variety of substantial Sterling Silver Settings by renowned and seasoned Native American Navajo Silversmiths Thomas Francisco and Jane Francisco. When mining operations halted and some new (private) rough released into the marketplace it lacked some of the luster we all fell in love with and for a couple years we had rejected more than half the finished jewelry presented for quality of stone. We have been very fortunate with recent releases and diversity of the Silversmiths. As in any Turquoise Mine or Vein, stones can vary and coloring changes depending on various elements with one being the specific metal content found. When Copper is evident Turquoise has more Blue tones and with Iron present Turquoise takes on Green coloring. These changes are most evident in the Nevada Carico Lake Mine with variations from Light Blue to Lime Green. 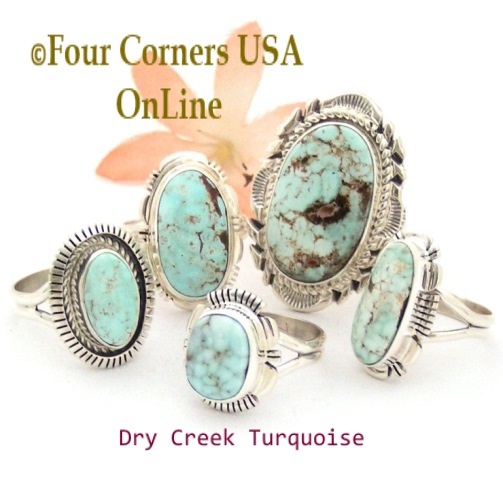 In addition to a Spectacular (but always limited) selection of Dry Creek Turquoise Earrings, we are proud to introduce an extensive Collection of Dry Creek Turquoise Rings at various price points including limited Dry Creek Turquoise Rings for Men (although Unisex depending on size and ring finger you are looking for!). 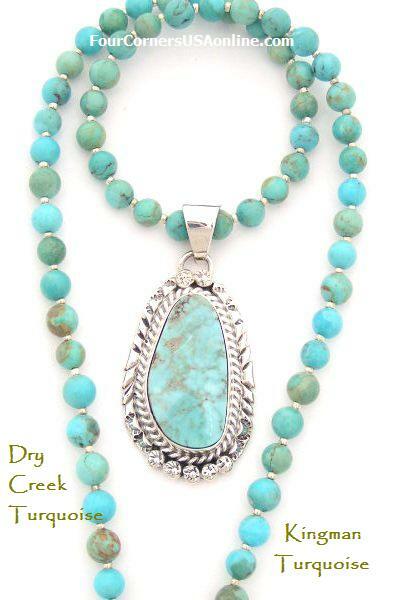 Dry Creek Turquoise Pendants for both Men and Women in an array of sizes, colors and shapes. Some Pendants we have combined with various Bead Necklaces for a truly unique and One of a Kind treasure. Wow...links of pure Joy! Dry Creek Turquoise Bracelets including limited Dry Creek Turquoise Link Bracelets boasting beautiful stone specimens of exquisite color and cocoa matrix signature to this mine. Large Dry Creek Turquoise Sterling Pendant by Native American Navajo Artisan Nita Edsitty with 17 to 20 Inch Adjustable Kingman Turquoise Bead Necklace. An absolute perfect combination of two different Turquoise mines. This Kingman Turquoise Bead Necklace is made from an unusual small production of rough stone which had both a blue and green mix which made it the perfect compliment to this deeper blue lighter matrix Dry Creek Turquoise Pendant. The greens and lighter matrix in the Kingman Turquoise Beads totally picks up the various tones and hues in the Dry Creek Turquoise. Not something you see everyday! 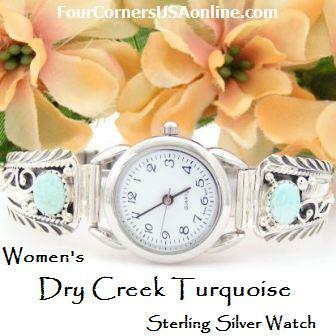 Traditional style Sterling Silver Native American Watches with Dry Creek Turquoise Stones ....sorry guys, currently we are limited to Dry Creek Turquoise Watches for Women. Bead Strand Jewelry Supplies from Mexico (temporarily strung bead strands for Jewelry Designers) were recently introduced into the Marketplace (2013/2014). They have a certain 'artistic' appeal with their uneven cut, various blue green color tones and pale to dark earthy matrix. 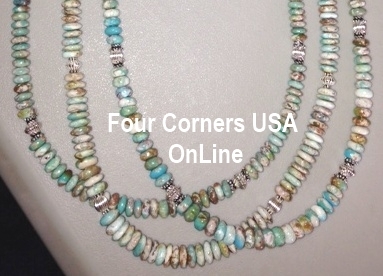 With the variation in colors, these beads are very attractive with many types of Turquoise and with the 'pale' color nature, Bead Jewelry Designers (whether Anglo or Native American) have found them complimentary to Dry Creek Turquoise Jewelry. When sold with a Native American made Dry Creek Turquoise Pendant, they often are 'perceived' as being Dry Creek Turquoise Beads...but they are not. There is much stone loss in the making of a bead (loss varies on shape of bead) that American Turquoise Beads are being depleted as we have begun to realize the 'treasure' beneath our feet will not last forever. So one would have to ask the question..."Am I really able to purchase Dry Creek Turquoise Beads for that price?" 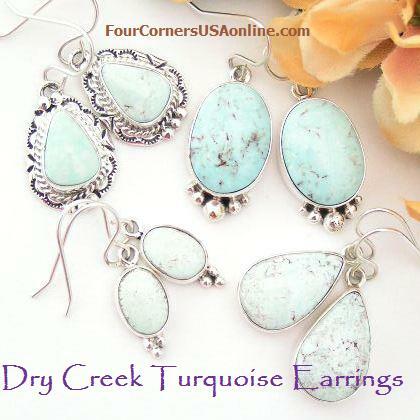 ... as Dry Creek Turquoise rough is very limited and most lapidaries will not cut stone for Earring pairs and Jewelry Sets as they can capitalize on single stone Pendants.